NEW YORK (CNNMoney) - The NFL's ratings fell sharply this season, but its games are still some of the most-watched events on television. The league's TV viewership dropped roughly 10% overall from last year. The premiere game of the week, NBC's "Sunday Night Football," was down 10% for the season; ESPN's "Monday Night Football" down 6%; and the averages of Sunday afternoon games on Fox and CBS were down 9% and 11% respectively, according to Nielsen data that came out this week. A number of factors on and off the field this season could have impacted the league's viewership. Early in the season, President Trump began a public spat with the league after he slammed players who took a knee during the national anthem to protest police violence and racial injustice. Trump's comments caused further debate and controversy regarding the protests, prompting more players to take a knee. The president repeatedly cited the anthem protests as the reason for the NFL's flagging ratings. On the field, big name players like Aaron Rodgers, J.J. Watt, Odell Backham and Andrew Luck were all injured at some during the season. Ezekiel Elliot, the running back for the Dallas Cowboys, was suspended for several weeks, which could have negatively impacted one of the league's most popular teams. This season's declining numbers also follow last season's 8% ratings drop. The good news is, the NFL is still the biggest ratings driver on television. Of the top ten most-watched telecasts last year, seven of them were NFL events, including the Super Bowl, which drew 111.3 million viewers. Thirty-three of the top 50 TV programs were NFL games. 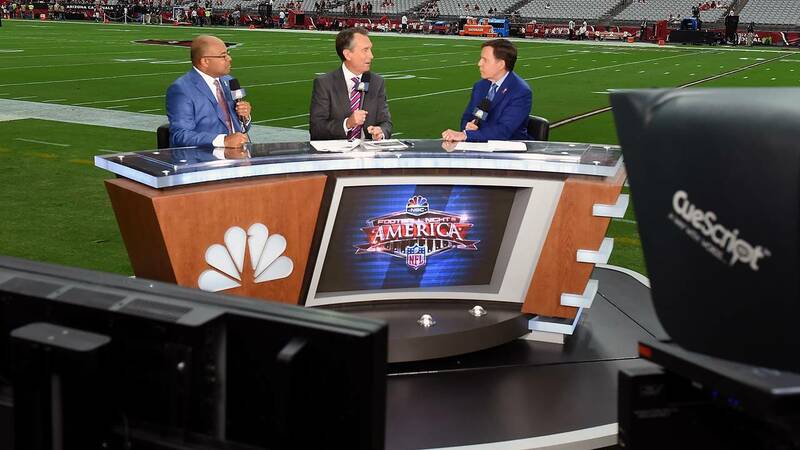 NBC's "Sunday Night Football," was still the #1 watched TV program last year averaging more than 18 million viewers, despite being down 10% from last season, according to Nielsen. The NFL Network also had a big year coming in as the second most watched cable sports network behind only ESPN. Yet, the league's numbers may continue to see declines as it heads into the first round of the playoffs this weekend. Popular teams like the Cowboys, Green Bay Packers and New York Giants, which were a part of the playoffs last season, failed to make the postseason this year.